For smart fiberglass attic insulation, you can be sure that ATX Radiant Barrier & Insulation has you covered. Our professional team of installers can help you get started on living in a more energy efficient home. Call us today to schedule a free in home estimate. If you want to reduce your cooling bills, you have to lower the amount of heat that’s coming into your home. The cooler you home, the less energy you consume, and one way of achieving this is with proper attic insulation. Without the right insulation, you may end up spending hundreds, even thousands of dollars a year on unnecessary cooling and heating bills. Fortunately, you don’t have to shell out hundreds of dollars every year on excess cooling bills. Most types of insulation require Austin homeowners to remove major structures in your attic. In most cases, homeowners end up tearing away most of the attic just to properly install the insulation. But let’s face it – not everybody’s willing to spend as much time, effort, and resources on attic insulation. 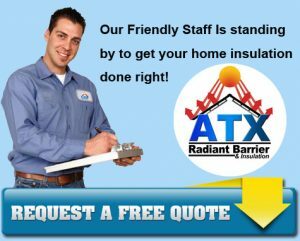 That’s why ATX Radiant Barrier & Insulation specializes in providing affordable, turn-key insulation solutions for Austin homeowners with a constant focus on quality. Although blown fiberglass insulation is one of our most budget friendly types of insulation offered by ATX Radiant barrier & Insulation, we also have the tried and true fiberglass batt insulation. Most home will have this type of insulation in the attic and walls of their homes. We didn’t want to leave this one out and make you think that it wasn’t offered or wasn’t an option. Our fiberglass batt insulation is American Made and we stand by our products 100%! Give Austin’s Number One Insulation Company a call today and let’s get your home feeling right and your bills reduced!